The Arduino development environment is probably the preferred development platform for the majority of Arduino users. It is lean and relatively easy to use. Quite a few examples are at your finger tip and even for people without much programming experience, it is relatively easy to get started. You can write and upload your sketches (programs) without the need to ever leave the IDE. 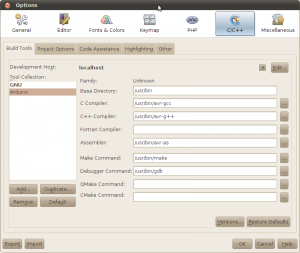 Despite its convenience, the Arduino IDE lacks some key features most modern IDEs have. To name a few, the Arduino IDE does not yet support auto-completion, code folding and contextual help. And the integrated parser sometimes have difficulties parsing complex code structures and do not give adequate information for the errors encountered. While it does not matter much for writing simple programs, the drawbacks are obvious when developing more complex applications. Since I am a software developer, I personally prefer a more advanced IDE. If you are using Eclipse, then there is already a plugin available for AVR development, though I have not personally tried it I have seen other people using it regularly. Looking at the Arduino playground instructions for this plugin, it seems that it is pretty straight forward to set up. But if you are using NetBeans, currently there’s no Arduino support yet. Luckily, it is actually fairly straight forward to add Arduino support in the NetBeans environment. 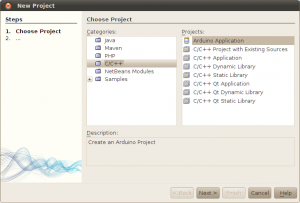 In this article, I will show you step by step instructions on how to prepare your NetBeans environment for Arduino development purpose. For those who are impatient and know your way around the NetBeans environment, you can download and install ArduinoPlugin_v1.0.tar.gz (Tools -> Plug-ins, under Downloaded tab, choose add plug-ins) and get started right away. You do need to configure your NetBeans environment to support avr-gcc tool chain before you can start using the Arduino module. If you are unsure how to do this, please read on. This plugin requires a functional Arduino development environment. Since this plug-in relies on the Arduino core libraries for code compilation, Arduino must be installed first. You can refer to the Getting Started with Arduino guide on the official Arduino site on how to install the Arduino programming environment. The instructions in this article assumes that you are running Arduino under Linux, but I think you can adapt it to Windows environment with relatively few changes. Here is a list of the software versions I have installed on my PC. Depending on your particular settings (e.g. the installation path of arduino-0018 is not located under your home directory or it is installed under a different directory name), minor modifications to the template might be needed. If you use libraries located in other locations, you will need to add those paths to the C/C++ compiler code assistance tab as well. Then go to Tools -> Plugins, under Downloaded tab, choose Add plugins. Navigate to where you saved the .nbm file and click OK.
To create an Arduino project, go to project new and choose Arduino project template. I tried to make the code structure look as close to that in Arduino IDE as possible, but for the code auto completion to work, some extra includes are needed. Also, note that I have included the MCU definition (#define __AVR_ATmega328P__) to get the the MCU specific intellisense work. You can change this to the type of MCU you are targeting. To build your project, right click on the makefile and choose make or make clean. If your build is successful, you should see a HEX file built in the applet directory within your project root. 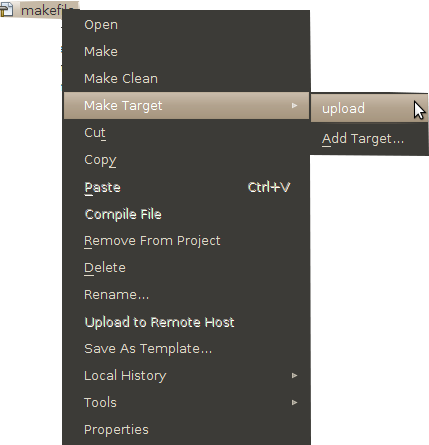 And you can use the Make Target -> upload option to upload the HEX file onto the Arduino board. 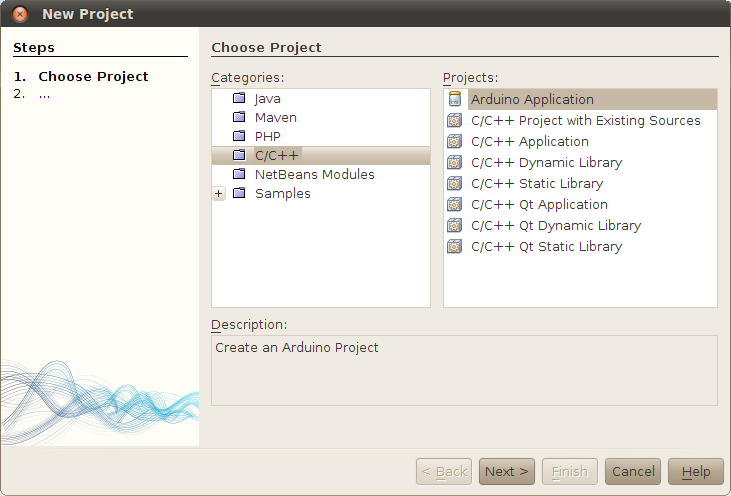 The Arduino plugin for NetBeans is developed as a NetBeans project sample module. The makefile is adapted from the make file used within the Arduino environment and is discussed here. I had put some additional comments in places where you might need to edit for it to work with your projects. For instance, your project may link to more modules than the ones listed below. #already listed below, you will need to add them accordingly. Also, I followed the technique used in the Arduino IDE to assemble the sketch with other necessary information and the main program at compile time (see the portion of the makefile below) to keep main.pde as simple as possible. The only issue is that compilation errors are referenced against the assembled source code rather than the code you write in main.pde. I had originally thought about putting all the necessary code in main.pde and thus would not require code merge at compile time, but it would make the code less compatible with the Arduino IDE environment. # Here is the “preprocessing”. Currently, there is no serial port monitor integrated with the NetBeans environment. So if your code uses the Serial class (i.e. Serial.println()), you will have to use the serial monitor bundled with Arduino. This should not be a big issue though, since even in Arduino, you have to click on the Serial Monitor every time after you upload the code to use it any way. I am planning on integrating the serial monitor with NetBeans in the future but it would probably take some time.